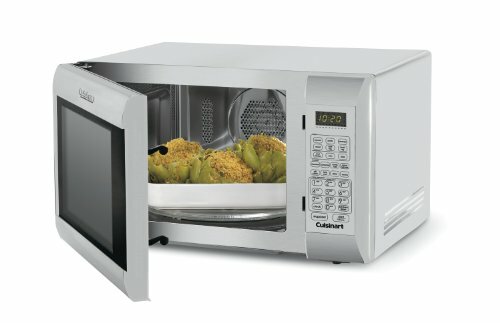 The Cuisinart CMW-200 Convection Microwave Oven with Grill offers a variety of cooking options in a very small footprint. This countertop cooking powerhouse can defrost, microwave, bake, and grill. Thanks to the movement of hot air, convection cooking and microwaving lets you prepare food quickly and efficiently. The CMW-200 is stainless steel inside and out, so it’s easy to clean and offers clean, modern lines. The programmable keypad features a backlit clock with LCD display. Creative cooking after a long day can be a challenge. However, a convection microwave/oven combo can speed up the process and get you out of the kitchen. While there are standard, simple settings for microwaving standard foods, you can also defrost by weight. This is a great way to safely defrost delicate foods including seafood without starting the cooking process and damaging the texture. Convection baking offers a faster method of cooking and gives a beautiful roasted finish to many meats and vegetables. Per experts with TheKitchn.com, even a covered casserole will benefit from the warm moving air of a convection oven as it will cook faster. Foods with leavening agents or fluffy foods like soufflés should not be baked with the fan on. Because the moving air will seal your food, and caramelize fats more quickly, convection ovens are ideal roasting tools. You will need to adjust your recipe, either by lowering the temperature, shortening the cooking time, or both. Monitor your convection oven as you learn the convection cooking process. Convection ovens heat food by two specific methods: a heat source and the movement of hot air. This oven features a heat source at the top and a fan at the back. By placing your cooking dish on the adjustable stainless steel grill, you get the food closer to the heat source. The display panel and programming capabilities will let you set up a series of cooking steps that include microwaving in the CMW-200. For example, you can defrost, then bake and grill or finish the top of a casserole without ever stopping the cooking process to reprogram. The rotating glass tray keeps your food moving and cooking efficiently and the reversible grill will keep your food at the right height from the heat source for a finished dish. Convection ovens cook faster at lower temperatures in less time. If your household is small, this convection oven could provide you with many of your cooking requirements and get food on the table fast. The programming capabilities let you move from microwave defrosting to convection baking to a broiled finish. No stopping, no stirring. For those with RV’s, this tool offers many cooking options in a very small space. Be certain to follow the clearance requirements for air flow to avoid damaging the unit due to overheating. While it’s true that you can use your regular baking dishes in your convection microwave/oven (as long as you don’t use metal dishes on the microwave setting) it’s important not to use deep baking dishes with high sides in your convection oven. This form of dish will make the convection feature less useful as air can’t get at the food. For cooks who need to quickly heat up leftovers, this is probably more microwave than is required. However, if you’re a fan of cooking ahead or someone who loves the flavor and look of roasted foods, this small convection oven can be a wonder.